You must be a member of the Brussels Live Music Group to attend this activity. Would you like to join this group? The refined, cool sound of Phronesis, the jazz trio of the Danish bass player Jasper Høiby, blends in remarkably well with the rich, warm sound of the Frankfurt Radio Big Band thanks to the intelligent, creative and virtuoso arrangements of Julian Argüelles. 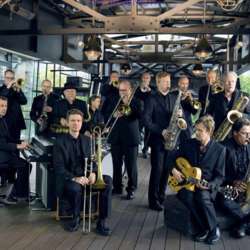 Phronesis and the Frankfurt Radio Big Band demonstrate that the whole is often greater than the sum of its parts. In other words, if you love big bands, then you will thoroughly enjoy this concert. We are glad to welcoming you to that particular concert! *(With regards to keep the group soul and seat together for easy socialising, making new friends, having fun and a great time our volunteer will buy tickets for group members. Then -No stress, Your place and ticket will wait You! Protected content last day to buy the tickets our volunteer – 28 of JANUARY) .